I've just spent three days subbing in First Grade. The classes were reviewing telling time. I invented this game years ago. The idea is to have the KIDS be the HANDS of the clock. Years ago, I bought a tarp and made a huge clock on it with Sharpies. Now...when subbing, I just put masking tape or stickies on the floor with the times on them. First graders don't tell time to the minute yet, so just the basic 1-12 numbers are needed. Then I ask for volunteers to be the hands of the clock. For each pair, I use two girls or two boys. The shorter of the two kids is the hour hand. The taller child is the minute hand. I give them a time such as 3:55 and they "drop on the clock." They do this face down. I thought the graphic was cuter face up. 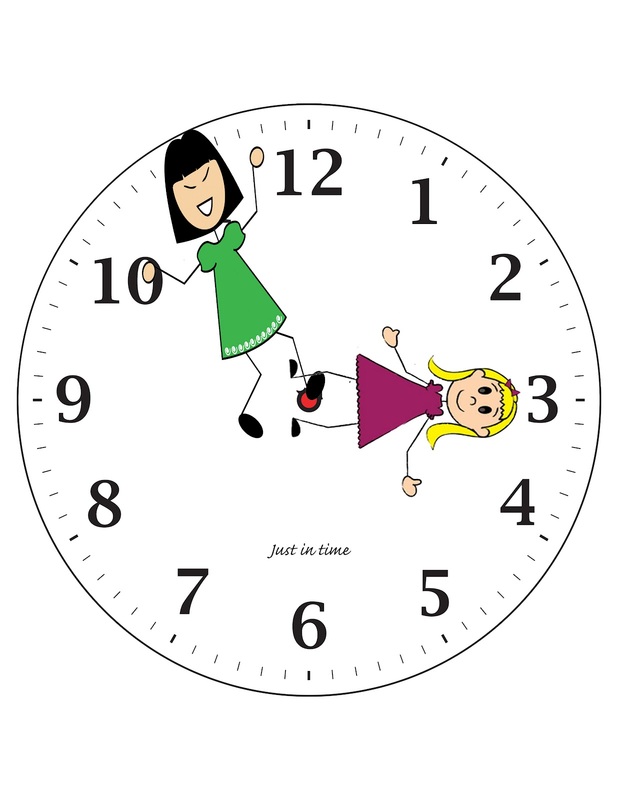 The reason the have to be paired as two girls or two boys is because if, for example, I said 6:30, the hour hand dives first. Then the giggling starts, because the minute hand must land on top of her/him. KIDS LOVE THIS. If you've seen my previous blog on time BUS STOPS, they know the quickest way to find the minute hands number is to go to the nearest bus stop (12:00, 3:00, 6:00, 9:00) and count on from there. Yesterday, this worked perfectly. They wanted to be the time callers also. We spent 45 minutes doing this and no one got bored. I was inspired by the book by Peggy Kaye, Games For Math. I bought it 20 years ago, but saw that it was still on Amazon.com. I highly recommend this book.